Recently I came across this Instant sambar recipe for idli, dosa without dal, vegetables and coconut in Papa’s kitchen YouTube video. We can call this as Dhidir sambar or pottukadalai sambar in Tamil. Its a very easy and simple sambar recipe with pottukadalai (Fried gram dal in English) , fennel seeds, onion and tomato as major ingredients. Fried gram dal and fennel seeds(soambu in Tamil) adds a nice flavor, thickness and kurma kind of taste to this tiffin sambar. I have already shared an idli sambar recipe almost in the same combination without using toor dal, moong dal and vegetables. 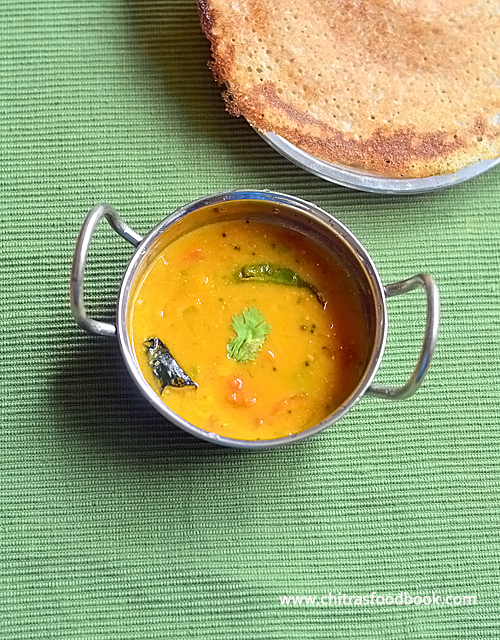 But this plain sambar is even more easy to make within 10 minutes. It came out really well and tasted great with hot idli and dosa but not for rice. Everybody loved it especially Sendhil appreciated me and had one more idli too. 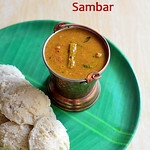 Even Raksha who is a big fan of toor dal and moong dal idli sambar had this sambar sans dal without any complaints. What else I need to post this recipe in my blog. So here you go Instant sambar without dal, vegetables for idli, dosa. You too give a try and share your feedback with me. Soon I will try to make a post on instant sambar without dal for rice. 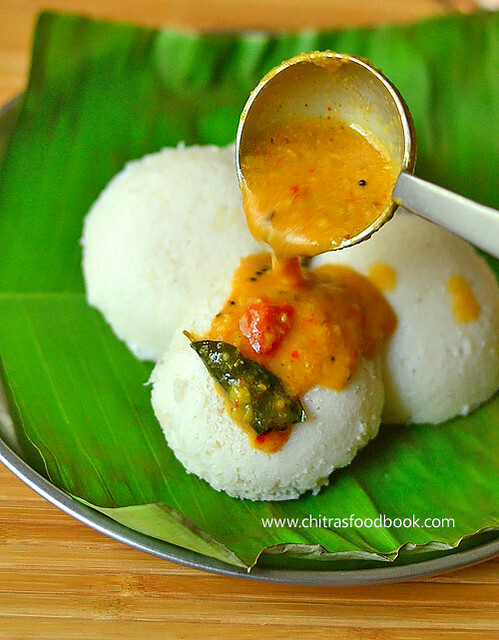 Check out 30+ Idli sambar varieties ! Instant pottukadalai sambar for idli, dosa without dal and vegetables. Grind pottukadalai + fennel seeds to a fine powder. Add water and mix without lumps. Set aside. Heat oil in a kadai. Temper mustard, urad dal, chana dal, red chilli, curry leaves, hing. Saute onion, green chilli till transparent. Saute tomato till mushy. Add red chilli powder, turmeric powder and salt. Mix well. Add pottukadalai water and 1 cup more water. Mix well and boil for sometime. Once it reaches the desired consistency, switch off the flame. Garnish with coriander leaves. Serve hot with idli, dosa drizzled with gingely oil/Nalla ennai. Wash and chop onion, tomato and green chilli. Grind pottukadalai + soambu(fennel seeds) to a smooth powder. Grind continuously for long time by wiping the sides. It helps to grind a smooth powder without grits else fennel seeds won’t grind properly. Add 1/2 cup water to this powder and mix well without lumps. You can grind again if you like. Keep this water aside. Heat oil in a kadai. Temper mustard seeds, urad dal, chana dal and red chilli. Add chopped onion, curry leaves, green chilli and saute till transparent. Add tomato and saute till mushy. Add turmeric powder, red chilli powder and required salt. Mix well for a minute. Add pottukadalai water without lumps. Add 1 cup more water based on the consistency of sambar. Mix well and boil for few minutes till you get nice aroma. Switch off the flame. Garnish with coriander leaves. Serve hot with idli and dosa by drizzling with Gingely oil / Nalla ennai or ghee. Enjoy with idli, dosa ! This sambar thickens when it cools down. So add more water, adjust salt, spice powders and reheat if you want thin sambar. Consistency of this sambar depends on your taste. Some people like thin sambar. So you can adjust the quantity of water accordingly. Fennel seeds gives a nice flavor to this sambar. So do not reduce the quantity. If you like, you can add potato and carrot. Tamarind is not required. Ripe tomato would do. For variations, you can use sambar powder instead of red chilli powder. Garnish with coriander leaves for nice flavor. Do not avoid it. 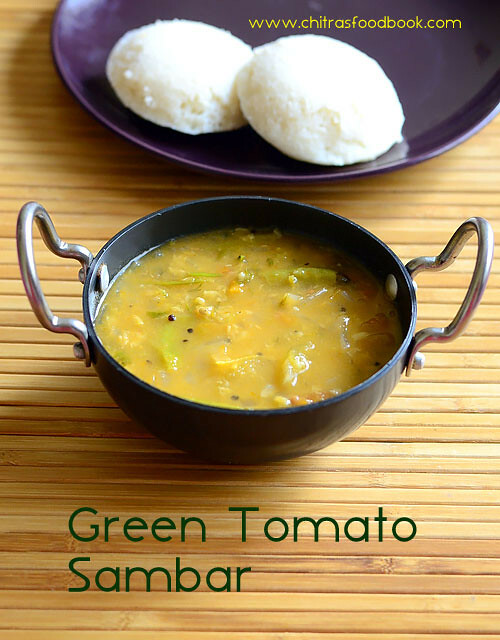 Try this easy, yummy, instant sambar for idli,dosa and enjoy ! I make varieties of idli, dosa at least thrice in week. So I keep trying different side dishes, it may be either chutney or sambar. As a result of this, I could share a collection of South Indian style 50 chutney recipes and 30 idli sambar/Tiffin sambar recipes in my blog. 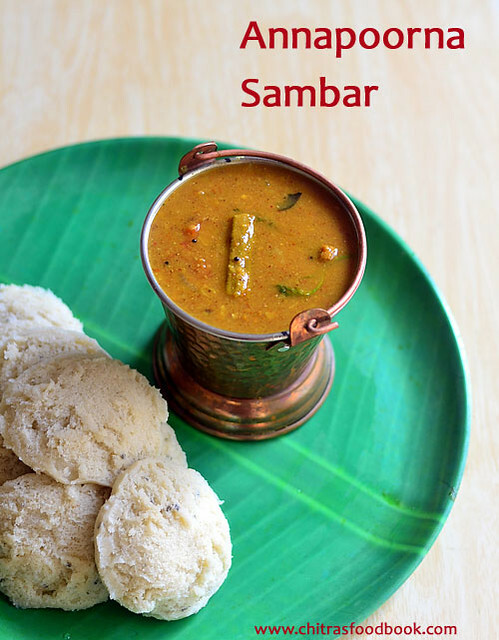 In my idli sambar collection, I have already shared few hotel style sambar recipes like Saravana bhavan hotel sambar, Tamilnadu style hotel sambar ( Madurai, Tirunelveli), easy restaurant style sambar, Udupi hotel style sambar and AAB sambar recipes. But my collection won’t be a complete one without some of the most popular idli sambar recipes like Coimbatore Annapoorna Hotel Tiffin sambar and Madras Ratna Cafe Sambar. I have tasted this sambar only once from Hotel Sree Annapoorna Sree Gowri Shankar near Coimbatore Bus stand and that too before marriage. To be frank, I did not remember its taste at all .So I was hesitant to try this sambar recipe from other blogs. Recently my friend Sudha suggested me to try this sambar recipe from Kannamma’s blog.Thank you so much Suguna & Chef Mr.Palanisami for sharing this wonderful recipe with us. After seeing the excellent feedbacks from many readers of Coimbatore, I got the confidence to try it. Just like other hotel sambar recipes, this one also calls for roasting, grinding and adding freshly ground spices.But the ingredients for sambar powder is different. Actually my friend had advised me to use half the quantity of ingredients as the yield of this sambar will be more for a 2-3 members family. So I halved the quantity of sambar powder ingredients & dal, modified the cooking procedure slightly for ease. Raksha & Sendhil loved it a lot. 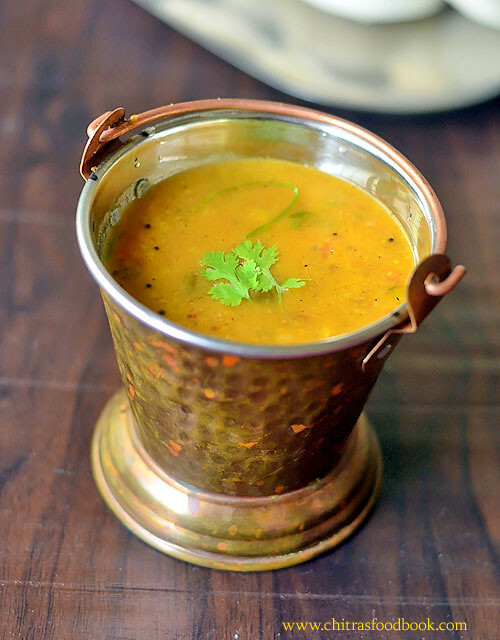 Friends, do try this yummy hotel style sambar recipe at home (If possible with drumstick). Its one of the best side dish for idli/ mini idli, dosa, pongal and vada. You will love it for sure. Ok, Lets see how to make this yummy, Coimbatore special Annapoorna hotel sambar recipe with step by step photos and a video !! Don’t forget to go through the “Points to note” given below. UPDATED : Recently I tasted this sambar in Annapoorna hotel, Coimbatore. I felt the sambar was more sweet in taste and I could smell some ginger too. So I have updated this recipe based on the one I tasted. Also I tried this sambar with drumstick and updated a picture above. When I added drumstick, it tasted good with rice as well. So this sambar can be had with rice if you add drumstick. But reduce the quantity of jaggery if making for rice. Also see the actual color of sambar. I served it with brown rice idli below. Please check the video recipe below. As per the original recipe, the quantity of drumstick should be twice that of toor dal. For this quantity, you should use 1 drumstick. Chop into small finger size pieces.Alternatively, you can use 2 brinjal, 1 medium carrot,1 medium sized potato. But flavor of the sambar may vary. If you add drumstick, u can serve this sambar with rice too. Color of the sambar also varies. This Sambar masala needs 12 ingredients. So please keep them ready in a plate before roasting. Roasting the spices perfectly is the key for this sambar.So do not burn them. According to the original recipe, the quantity of tamarind and jaggery should be equal. But I reduced the jaggery as Sendhil doesn’t like the sweet taste in sambar. I used long red chilli but original recipe called for using guntur chilli. So slight color deviation in the sambar was there. The original recipe called for pressure cooking tomato, onion and drumstick pieces separately for one or two whistles in high flame whereas I cooked them along with the dal by keeping them in a small box inside the cooker. Refer the pics and video for more detail. I did this to reduce the cooking time of sambar. As a general rule of hotel sambar, it tastes the best when you give more standing time.So if you prepare this sambar for your guest, prepare it 3-4 hours in advance. Reheat it at the time of serving. The yield of this sambar will be more as it thickens when cools down.So add little water at the end, mix well, check for salt and then serve. 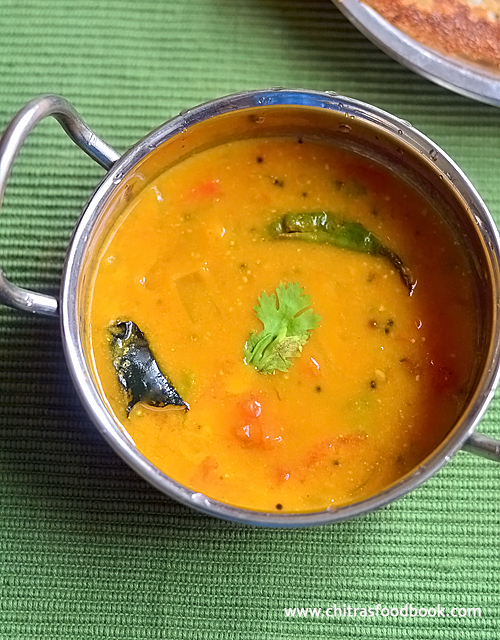 If you want to make this sambar only for 2 people, use half of the quantity of ingredients mentioned. Adding ghee at the end is a must. It gives awesome flavor to this sambar. Garnish with coriander leaves without fail. 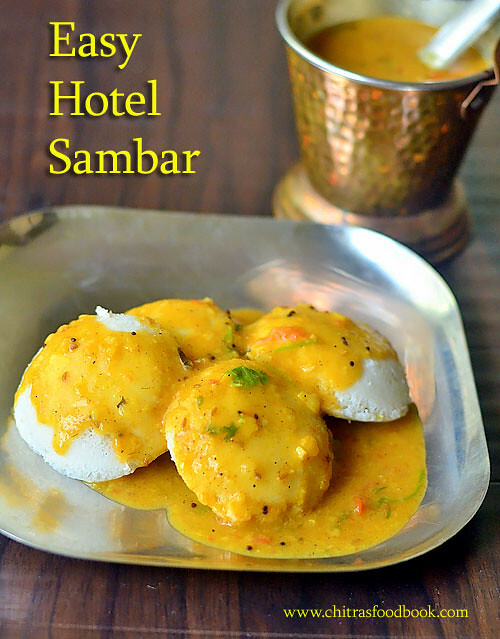 Coimbatore Annapoorna Hotel Idli Sambar Recipe - One of the best hotel sambar recipes ! In a cooker base, add toor dal, 2 cups water, 1/4 tsp turmeric powder and few drops of cooking oil. In a small box, add chopped onion, tomato, drumstick pieces or other vegetables if using. Add 1/4 cup water. Keep the box inside the cooker. Pressure cook in low flame for 2 whistles. Open the cooker and take the box out. Keep aside.Mash the dal with a whisk or ladle. Set aside. In a kadai, heat 2 tsp sesame oil.Roast methi seeds, cumin seeds, chana dal, urad dal, red chilli, pepper corns, dhania and roast till dals turn golden in color. Add pinched tamarind. Saute for a second. Add the curry leaves, hing, grated coconut, ginger and jaggery. Saute for 30 seconds. Grind this mixture to a smooth paste adding 1/2 cup water. Slightly coarse paste is also fine. In the same kadai, add the ground paste + 2 cups of water.Mix well and boil for few minutes. Add the cooked onion+ tomato + Veggies mixture.Boil for a minute. Add the mashed dal, required salt & boil the sambar in medium flame for few minutes. Heat oil in a kadai and when it gets heated , splutter mustard seeds, curry leaves.SWITCH OFF THE FLAME ! Add red chilli powder, mix well quickly and add this to the boiling sambar. Do not burn the red chilli powder. Boil the sambar for a minute. Last but not the least, add 2 tsp ghee, chopped coriander leaves and mix well. Serve hot with idli ! This sambar becomes thick as it cools down.So add water to adjust the consistency before serving.Check for salt as well. Adjust the quantity of red chilli & chilli powder if u want more spicy taste. Do not add more tamarind. Tamarind should be minimum for idli sambar. This sambar becomes thick as it cools down.So add water whenever needed, mix well. Check for salt and serve. 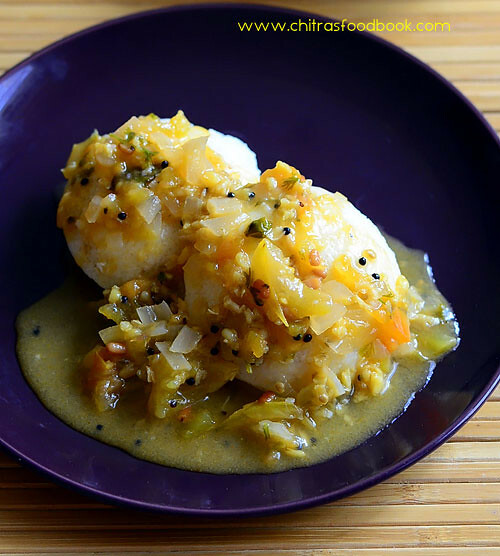 Enjoy this yummy idli sambar with piping hot idli ! Tastes great. 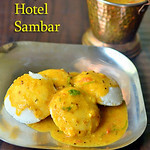 This is an easy version of hotel sambar recipe for idli without making hotel sambar powder. Usually I make Tamil nadu Hotel style idli sambar adding freshly roasted and ground spices. To make my job easier, I started making Idli sambar powder in bulk and use it to my need. Few months back, I watched Venkatesh Bhat’s hotel style idli sambar recipe in Samayal Samayal cookery show. 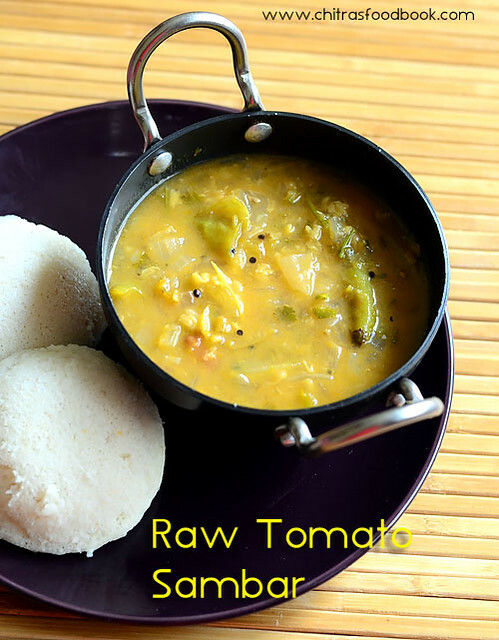 It is a simplified & quick version of restaurant style idli sambar without any grinding job. 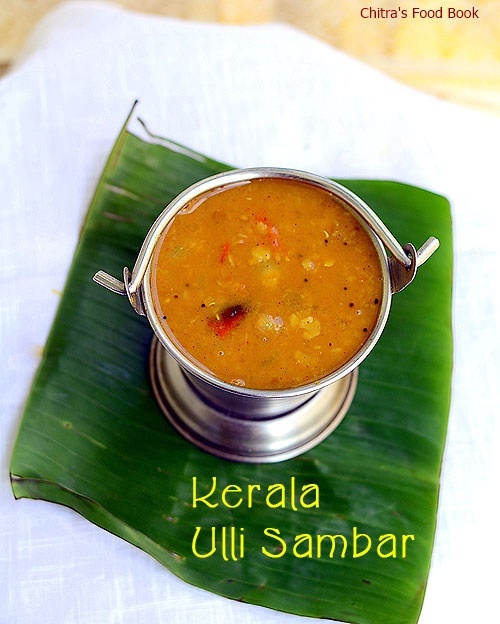 As I had already tried Kerala ulli sambar recipe (Vengaya sambar), I found this recipe very close to it. So I tried it confidently. As expected, it came out really well. I started making it regularly with my own modifications. This has become Raksha’s favorite idli sambar. It tastes good for all tiffin recipes like Idli, dosa, vada, Pongal and rice upma as well. For variations and to make it more healthy for your kids, you can add vegetables like potato, carrot & use few pieces of pumpkin instead of jaggery to give a natural sweetness in sambar. This sambar tastes mildly tangy and spicy which makes it drinkable. So you can dunk your idlis in this sambar and enjoy eating it ! If you like the taste of this sambar, you can use this sambar recipe for making mini idli sambar and sambar vadai. 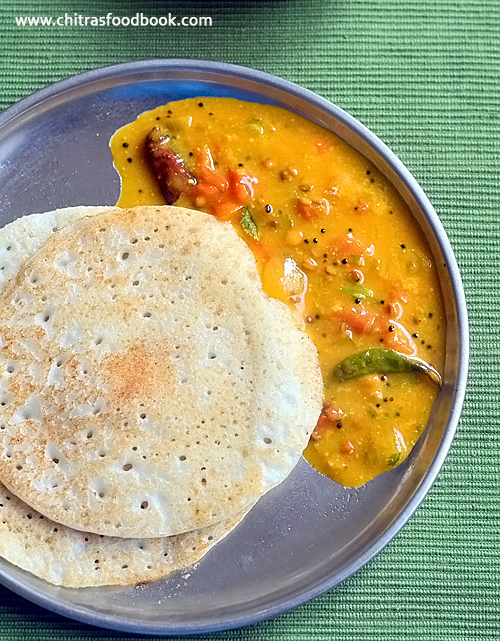 Try this easy version of idli sambar and prepare a quick side dish for idli, dosa during busy morning hours. Ok, lets see how to make hotel style idli sambar in an easy way ! 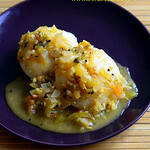 Check out my other Idli Sambar varieties too ! ** Use 3 pumpkin cubes along with dal to get natural sweetness in sambar. **Add mixed vegetables like carrot & potato with dal to make it more healthy.Use one tomato if its bigger in size or sour in taste . Wash and take the toor dal, moong dal in a pressure cooker base. Add 2 cups of water and let it soak for few minutes till you chop onions. Chop the onion and add to the cooker. Add 2 small or one big whole tomato ( Do not chop the tomato because dal may not cook mushy), turmeric powder, curry leaves, hing and few drops of cooking oil. Add enough water and cook the dal in low flame for 2 whistles. Remove the lid after the steam is released. Mash the dal + tomato very well. Make sure dal is well cooked and mashed well. Dilute besan flour in 1/4 cup of water and add to the cooked dal ( ** Adding besan flour helps to get a creamy texture to this sambar and blends well with dal). Add jaggery. Mix well. In a kadai, heat ghee. Keep the flame low. Splutter mustard seeds, methi seeds, urad dal, cumin seeds & sambar powder, red chilli powder and dhania powder. Saute for few seconds without burning sambar powder. Do not change its color. Add the mashed dal + besan flour mixture to the kadai. Boil the sambar for few minutes by adding chopped coriander leaves and 1 tsp ghee. Check for taste, Add salt or red chilli powder if needed for spicy taste. Boil for one more minute. Switch off the flame ,cover the sambar with a lid and give a standing time of one hour before serving. This sambar thickens when it cools down.So add 1/2 cup water to adjust its thickness and check for salt. Reheat it if you wish and then serve. Enjoy with hot idli, dosa & pongal. Drizzle a tsp of sesame oil or ghee if you like ! 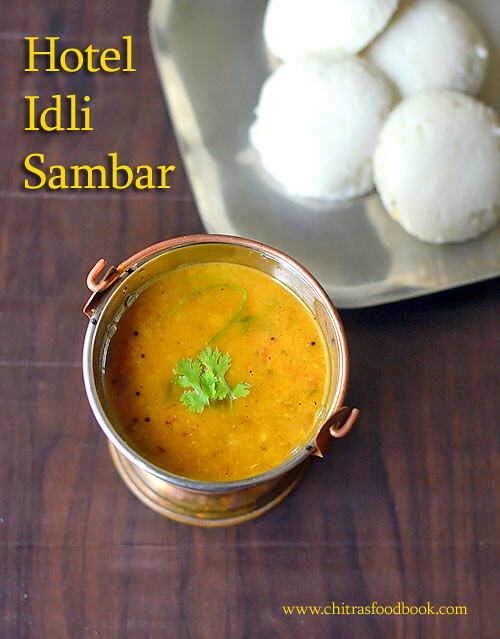 Try this easy version of hotel idli sambar at home and enjoy with piping hot idlis ! Most of us make kheer/Payasam using fine vermicelli. Me too no exception. Recently I bought a big pack of fine vermicelli to make sheer korma during Ramadan festival. I had nearly 1/2 kg of fine vermicelli leftover in hand and I wanted to try some interesting and a different recipe with it. I asked our blogger friend Lubna Karim to suggest some fine vermicelli recipes. 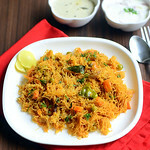 She shared Khara vermicelli masala upma recipe from her blog. I tried it for our breakfast and shared the picture in my Instagram and facebook pages too. After that, I have made this upma twice but I couldn’t make a post here. This morning I made it just for blogging sake. The list of ingredients may seem more. But its very easy to make and cooks faster than our regular vermicelli. So you can prepare this upma for breakfast or dinner in just 10 minutes. This dish is ideal for bachelors and working women. 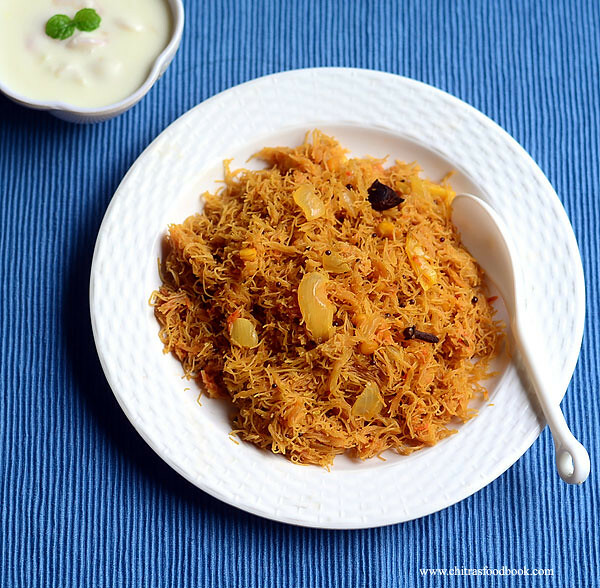 It tastes like semiya pulao and resembles Idiyappam(Rice noodles) with mild masala flavor. You can add mixed vegetables and make it more colorful and healthy. You can try this upma with thick vermicelli too. But water quantity varies.This upma stays soft for hours.So it can be packed for lunch box too. Kids would love it for sure. I liked it with coconut chutney as side dish whereas Sendhil & Raksha loved it with onion raita. 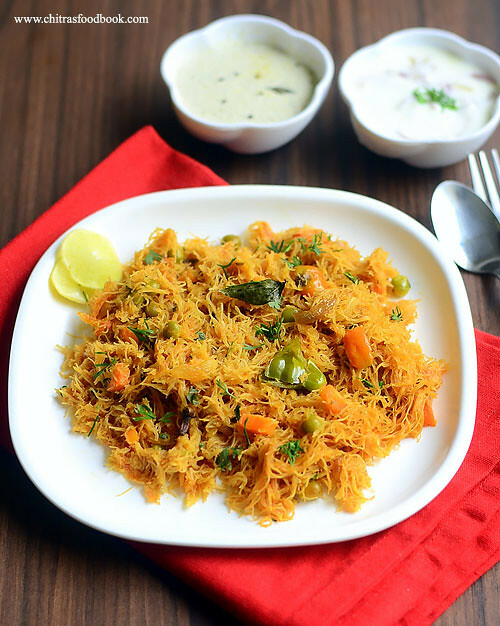 Do try this masala upma with fine vermicelli and share your feedback. Soon I must try fine vermicelli kesari too. Also check out my Fine vermicelli Payasam Recipe. NOTE : In Bangalore, you can find Fine vermicelli in Nilgiris, Jayanagar 4th block BDA complex Pooja materials shops, MK Ahmed stores. I have tried this upma with & without vegetables.So the step by step pictures slightly differs from the main picture. Wash and slice the onion, chop the tomato, slit the chilli and finely chopped vegetables ( If adding). Heat a kadai with oil. Splutter mustard seeds, urad dal, Chana dal, Cinnamon, cloves and fennel seeds. Saute and add sliced onion, green chilli and ginger-garlic paste. Saute well till the raw smell of g&g paste goes off. Now add the chopped tomato pieces,mixed vegetables ( If using). Saute until tomato turns mushy and veggies are half cooked. Add turmeric powder, red chilli powder, garam masala powder, required salt and mix well. Add 1.25 cups of water and cover the kadai. Let the vegetables cook for 2 minutes. Break the fine vermicelli strands into two.Add them to the boiling water and mix well. You may feel water quantity is less for vermicelli. Don’t worry. As soon as you mix the vermicelli with the water, it will absorb all the water and becomes soft. So keep tossing and flipping it gently. If possible, use a fork like ladle to avoid vermicelli turning mushy. Keep the flame minimum and cover the kadai. Let it cook for 2 minutes. If you feel the vermicelli looks too dry and not cooked properly, you can add 1/4 cup of water at this stage and mix well. ( Water quantity is the key to get perfectly cooked,fluffy upma. If you add more water, it will turn to vermicelli khichdi. So please use less water and add more only if needed). This vermicelli turns fluffy and separate when it cools down. Lastly add 2 tsp of ghee and garnish with coriander leaves. Sprinkle some lemon juice if you like. Mix well and serve hot. Enjoy with coconut chutney & onion raita ! 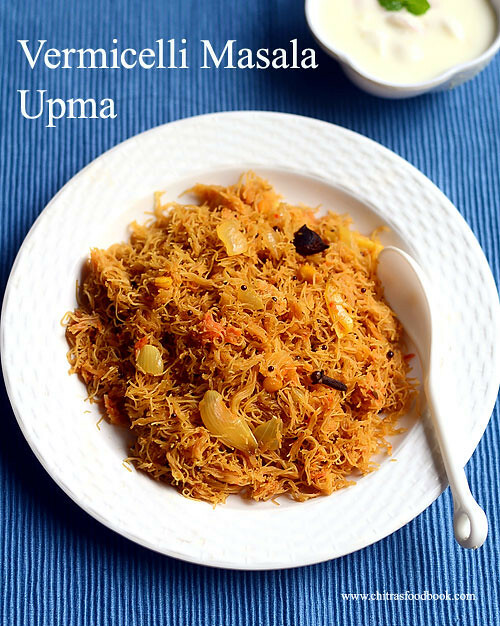 Try this easy to cook, yummy fine vermicelli masala upma for breakfast/dinner. You will love it like me. 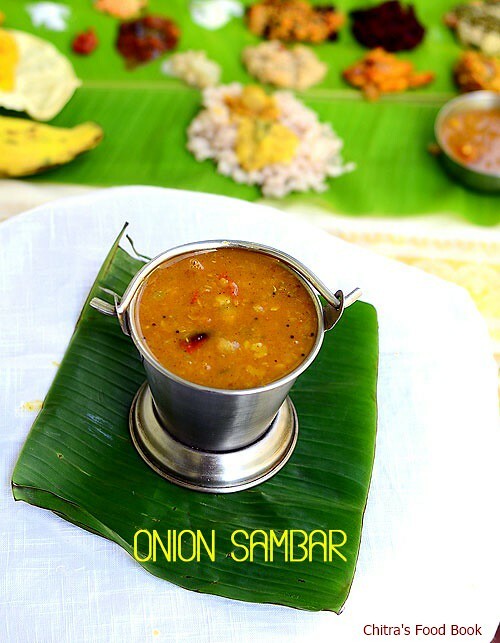 For every Onam sadya menu,I love to try varieties of Kerala style sambar.I have tried Mixed vegetable sambar and Arachuvitta sambar. 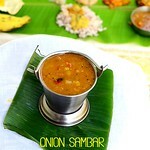 This year, I prepared Kerala Ulli sambar/Onion(Shallot) sambar without coconut for the first time from Kothiyavunu. It was easy to make without coconut, grinding job and tasted yummy just like restaurant style sambar. It was a good side dish for idli,dosa & tiffin varieties like pongal,upma and it was also a good accompaniment for plain rice.We loved this sambar very much.The highlight of this recipe is that the spice powders are roasted and mixed with the sambar at the end.It gives a superb flavor to the sambar and tastes more like hotel ones.You can try this sambar for mini idli.It tastes awesome with ghee.Do try this easy sambar recipe for this Onam sadya and enjoy.Lets see the preparation of Kerala style ulli sambar . Check out our Tamil nadu style Vengaya sambar recipe for rice. Soak tamarind in war water and take the extract using 1 cup of water.Pressure cook toor dal adding enough water,turmeric powder & a pinch of hing.Mash well and set aside. Heat oil in a kadai and saute the small onions,green chillies,curry leaves till onion turns transparent. Add the tomato pieces,salt & saute till mushy. Add the tamarind extract,turmeric powder and boil well. Add jaggery.After the onions are cooked well,add the mashed dal. Heat oil in a kadai and when its heated , splutter mustard seeds,cumin seeds,hing,sambar powder,red chilli powder & dhania powder.Mix well in medium flame and add everything to the sambar.Boil well for a minute.Add raw curry leaves.Switch off the flame and garnish with coriander leaves. Enjoy ! Make sure you don’t burn the masala powders while roasting. Adding them at the end is the highlight of this ulli sambar.So do follow the same. Add more chilli powder & sambar powder as per your taste. You can also add big onions if you don’t have small onions in hand.But small onions gives the nice flavor. 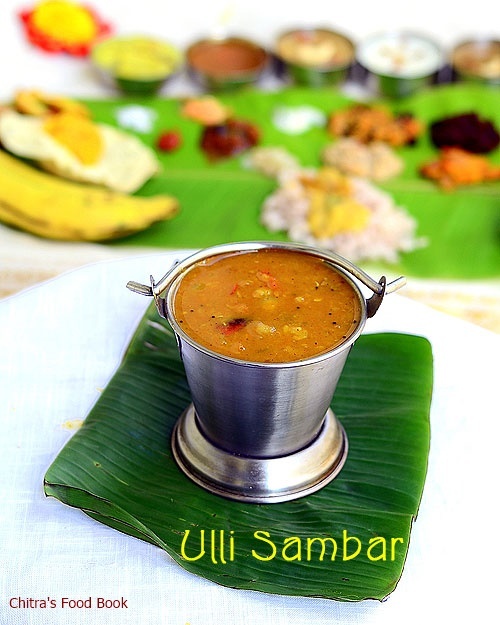 Enjoy Kerala style Ulli sambar with by mixing with plain rice & ghee.It can also be had with Idli,dosa & pongal !